The Big Dig has its critics, but few can deny that it was a big, bold idea that made cities everywhere pay attention. What if the next big idea for Boston wasnâ€™t actually that big -- but, instead, was a series of smaller ideas about smart, resourceful ways to use the city's physical assets? Around the world, cities are finding bold and interesting ways ways to repurpose, re-imagine, and reprogram what they have. With the new mayor on the horizon â€“ and several campaigns touting the importance of innovation â€“ can Boston tap into the new generation of urban creativity? Here are ten ideas to consider. Beating up on City Hall plaza is a recreational sport for Bostonians, but its vast expanse of brick steps could be the home to a futuristic city park â€“ or dozens of them. 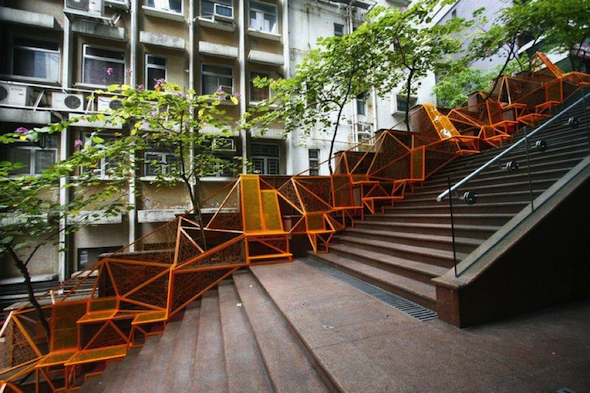 The Cascade by Edge Design Institute is a self-contained urban park that attaches to public stairways to transform them into attractive spaces for rest and social moments. 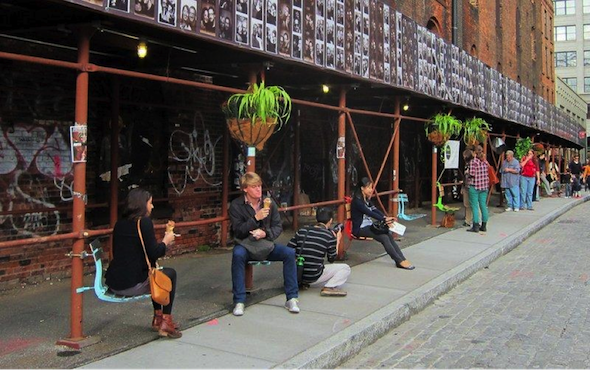 Softwalks, a New York-based company, has transformed scaffolding â€œsidewalk shedsâ€� into areas for street-side dining and hanging out. Created by designers Bland Hoke and Howard Chambers, its seats, benches, counter tops and planters bolt onto existing scaffolding structures to make them destinations instead of areas to avoid. Designer Jean-Baptiste Hardoin created La Grande Cantine, a table that transforms individual waterfront seating areas into picnic areas. 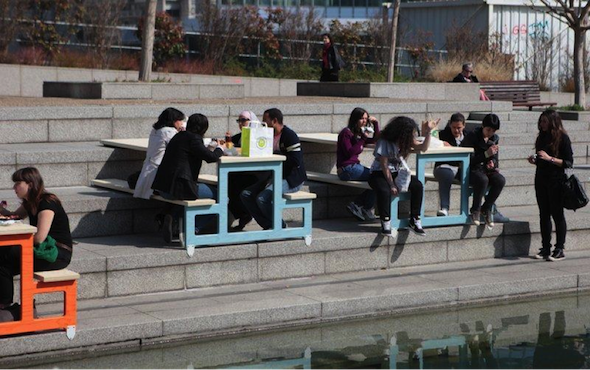 Now, people can sit facing one another while eating, talking, or holding outdoor meetings. A picnic on the waterfront sounds like a nice weekend idea; now it could be a suggestion to co-workers at lunchtime. 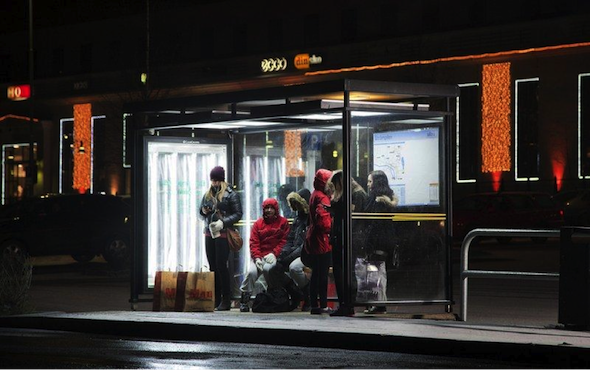 The far north of Sweden has so little natural light during the winter months that local energy company Umea Energi installed light therapy tubes in some of the cityâ€™s bus stops to dose up riders with good light vibes while they wait. The commuter rail already has its Quiet Cars, so why not Light Therapy cars? The special carriage could exist on each T train, as well, for those who need help turning their winter frowns upside down. 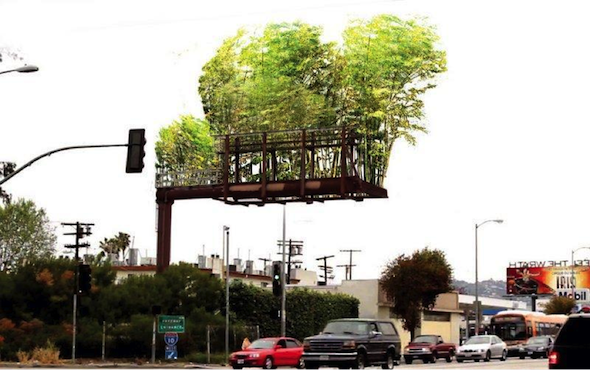 The large billboard structures that currently line our roads could be the home of bamboo nests to clean the air. Urban Air is an initiative created by Stephen Glassman to swap the commercial ads for air scrubbers and natural cooling units along urban motorways. Interspersing Bostonâ€™s skyline ads with miniature bamboo forests would give stressed Boston drivers some much needed moments of green calm, and cleaner air as well. Nine months from now, Boston's new students will move out again, leaving huge piles of domestic items and personal possessions along the streets. 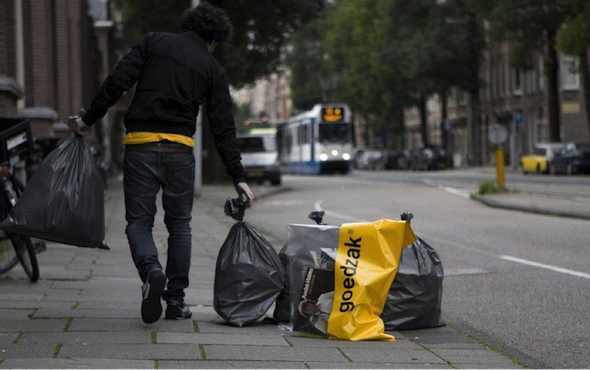 Dutch design firm Waarmakers has created Goedzak (meaning both â€œgood sackâ€� and â€œdo-gooderâ€� in Dutch): a transparent bag to reduce whatever stigma may exist from curbside recovery temptations. Goedzak invites residents to fill the bag with items that could be of use to someone else. On trash day, the bags are placed outside with the regular refuse, creating a weekly freecycling routine. The footsteps of the thousands of commuters who move through MBTA stations is an energy source that could be put to use to power the resource-heavy system. 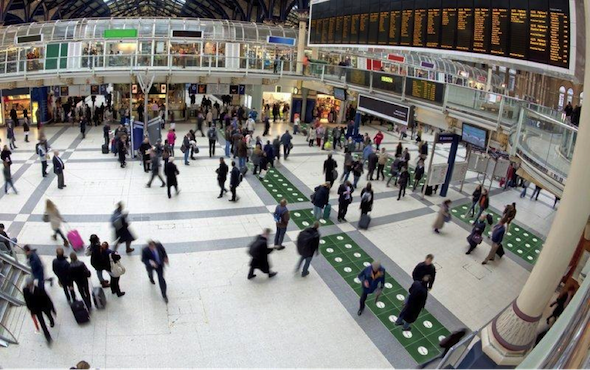 UK company Pavegen created a tile that captures the small force exerted by each commuter footstep and turns it into energy. It could give the MBTA the extra boost it needs. Inside each of Boston's parking pay machines is a networked Wi-Fi system, a computer, a printer, a payment processing system, and location-aware technology, all powered by a solar panel -- and all sell you a chunk of time. Designer Mayo Nissen wants to put the full capabilities of these machines to use. At the Boston Society of Architects BSA Space Gallery, Nissen reprogrammed a Boston parking pay to link with the cityâ€™s 311 reporting system for things that need to be fixed. 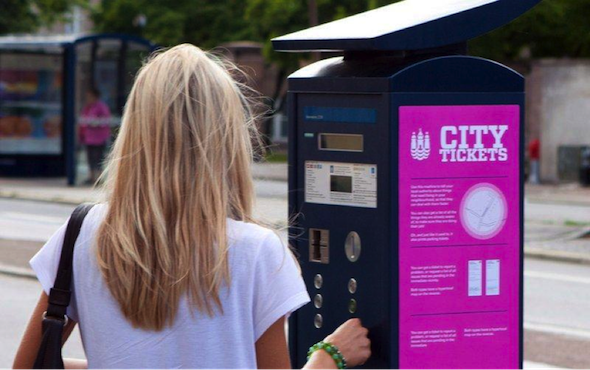 With his City Tickets machine, people can pay for parking, print out a list of reported faults in the area, and hear how the city is dealing with each report. They can also share their own ideas for how nearby area could be improved. 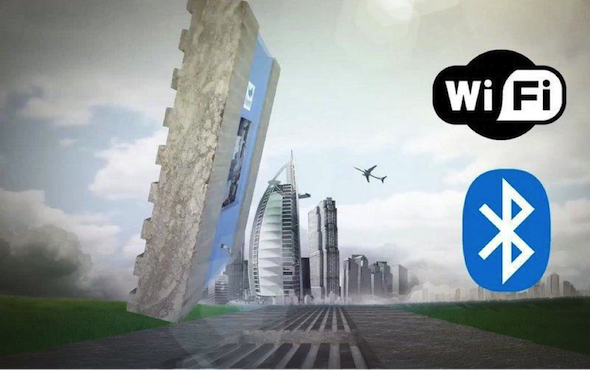 Madridâ€™s Via Inteligente invented iPavement technology, which embeds Wi-Fi connectivity and data apps into the cityâ€™s pavement slabs. With each extension of a hard surface in the city comes the ability to extend data connections, as well. The next time Boston looks to fix its sidewalks, it could also upgrade its online social and economic capabilities. 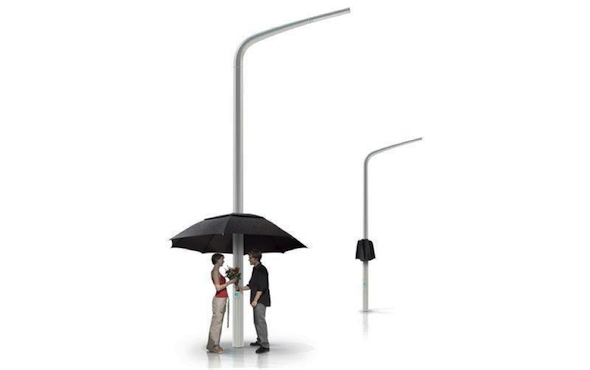 Designed by Mikhail Belyaev of St. Petersburg, the Lampbrella is a street lamp fitted with an umbrella top that remains closed when not needed. When it begins to rain, a sensor expands the umbrella to provide shelter for those in need. All these ideas, and more information and images of each, are on display at the Boston Society of Architects BSA Space Gallery until September 29. Scott Burnham is an urban strategist and design director who has created and directed initiatives in 11 cities worldwide. He most recently created the Made of Jesolo design initiative for the City of Jesolo, Italy and the Reprogramming the City exhibition for the Boston Society of Architectsâ€™ BSA Space Gallery, Boston, MA. Meet the Mayoral Candidates: How would you curb congestion?